My daughter-in-law is returning to school to complete a Bachelor Degree. The kids are in high school, and she is looking for future opportunities in the workplace. Although most of the family is very encouraging, her sister asked how she could do this when her job requires her to travel so often...a shadow of doubt. 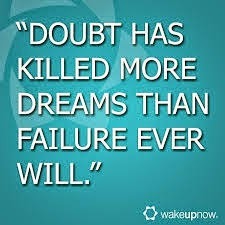 Doubt is insidious...it creeps into the brain and spreads, making you question your decision. "What are you thinking?" "There's no way you can possibly juggle school and a full-time job, especially a job that requires you to travel." "You will never be able to keep up with everything. What if you get your degree and you don't get promoted?" "It's safer to stay where you are." I can only go my personal experience. I also worked full-time and went to school full-time. It was hectic, but once I got the rhythm of my new schedule down, it was certainly do-able. When it came time to do an internship, I remembered the words of one of my professors: "Say Yes to things you want to do. You will find a way". This turned out to be true for me. A woman who worked down the hall from me was in the same program as I and needed to do an internship at the same time as I. Her supervisor allowed her to rework her schedule to have a day off. Grudgingly my supervisor had to give me the same opportunity, which allowed me to complete an internship. Coincidence? I don't know. I had no idea who this woman was and didn't realize we were in the same program...but it certainly was a lucky break for me. The moral of this story is...if you are driven to do something, never ask "How"...just say "Yes". You will be amazed at how the universe aligns to make it possible.